In my previous post for the Tucana blog, I explained why I believed that 2016 would not only see a marked increase in the adoption of analytics within HR, but also a rise in the sophistication of the work that is being undertaken. Fortunately, on this occasion, I am confident that my mouth will be spared the ordeal of munching on glass, and two recently published studies by IBM and Deloitte confirm that adoption of people analytics is rising. Firstly, IBM’s CHRO study ‘Redefining Talent’, examines how CHROs are reorganising their functions in light of the advance of new technologies and the convergence of the consumer and employee mindset. These changes will act as a catalyst for the transformation of the HR function. For example, the rapidity of evolving technologies will entail organisations being in a constant state of transformation with workforce planning and skills development being a continual rather than an occasional requirement. Analytics is the key to effective workforce planning. 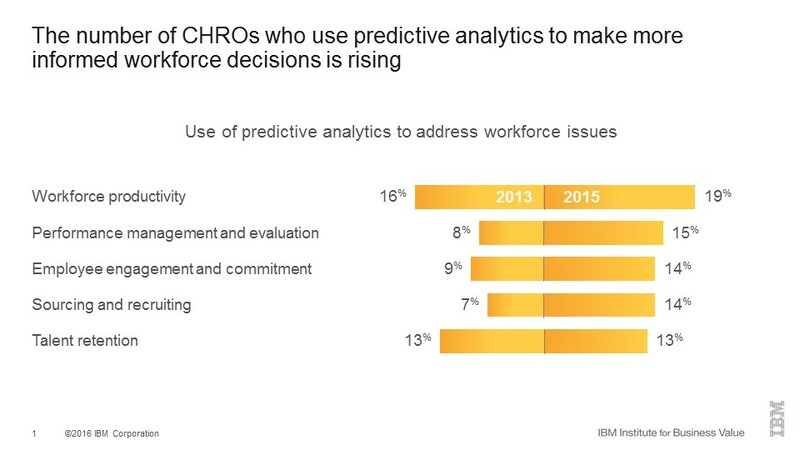 Perhaps not surprisingly then, the study found that an increasing (if still small) number of CHROs are using predictive analytics to tackle workforce issues (see Figure 1 below). Whilst developing this capability isn’t easy, CHRO respondents stressed the importance of trust between HR and the business being key to the success of people analytics initiatives. Put in simple terms, the HR function must trust the business to act on the insights it produces, while the business must trust the methodology, assumptions and data HR uses to identify these insights. The findings of the IBM CHRO study were echoed in Deloitte’s Global Human Capital Trends 2016 report. Of course, it was Deloitte’s corresponding report last year that tabled people analytics was “stuck in neutral”; with the level of talk on the subject not mirrored in actual adoption by the HR function. The percentage of companies that believe they are fully capable of developing predictive models doubled from 4% in 2015 to 8% in 2016. In 2015, only 24% of companies felt ready or somewhat ready for people analytics; this has jumped by one-third to 32%. Finally, 77% of respondents believe that people analytics is important (I’ll leave you all to ponder what that says about the other 23%). Both the IBM and Deloitte studies also cover the areas in which organisations that have adopted people analytics are conducting analysis. It is a pretty comprehensive list and demonstrates how HR functions are looking beyond justifying the ROI of talent initiatives and tackling real business issues such as: sales performance and recruiting, productivity, retention, compliance and risk, culture, engagement and listening to and acting on the employee voice. Most HR functions are still learning to look at what might happen rather than what has happened as they shift emphasis to analytics rather than reporting dashboards and visualisations. Certainly, this is still an area of confusion as I’ve lost count of the number of times an HR leader has said ‘analytics’ and then actually described their requirement as reporting. Of course, reporting is not analytics, but it is still taking time for the message to get through. This is not helped by a number of vendors masquerading their reporting and visualisation offerings as analytics. But that is probably a topic for another blog! We certainly seem to have reached an inflexion point, which means that the People Analytics conference in London on 27th and 28th April could not be better timed. I’m looking forward to co-chairing a fabulous line-up of speakers and a comprehensive agenda covering pretty much every aspect of the analytics journey. You can still book your tickets here too. Hope to see you there. David is a Co-Chair of the People Analytics 2016 Conference, and is a respected influencer, writer and speaker on people analytics and the future of work. He was recognised as Best Writer at the 2015 HR Tech Writers’ Awards, and was awarded one of ten LinkedIn Power Profiles for HR in January 2016. David’s role as Global Director, People Analytics Solutions at IBM enables him to help clients apply an analytical, insight led and business outcome focused approach to their talent strategies and people decisions. 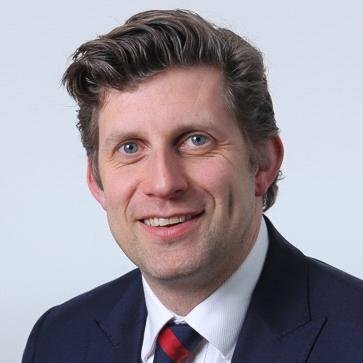 Please feel free to connect with David on LinkedIn, and follow him on Twitter. Next PostWill Predictive Talent Analytics make Instincts Extinct? HRM Scholars, Where are you in the HR Analytics Debate?